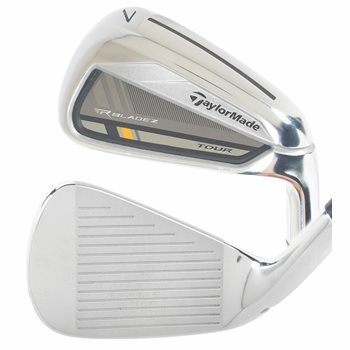 The TaylorMade RocketBladez Tour Iron Set feature individually designed blade-like heads featuring compact shape, thin topline, thin sole, minimal offset and shallow cavity. The RBZ Speed Pocket works in conjunction with an improved Inverted Cone design to promote more ball speed, higher flight and significantly less speed loss on mis-hits low on the face. The result is the first tour iron with serious technology to promote a higher, stronger, distance-enhancing ball flight with consistency with sharp distance-control and soft, quick-stopping landings. RocketBladez Tour irons will help players consistently hit their approach shots closer to the hole. For better players seeking higher, longer more accurate flight in a highly forgiving and great-feeling Tour-shaped iron. Nine individually designed blade-like heads (3-iron – AW) featuring compact shape, thin topline, thin sole, minimal offset and shallow cavity. Maximum speed and flight enhancement technology in the 3- through 7-iron: The RBZ Speed Pocket promotes consistently high ball speed and distance on off-center hits, especially low on the face. Consistent distance with every iron made possible by careful management of the RBZ Speed Pocket, improved Inverted Cone, CG location and MOI. 11 grams of weight is strategically redistributed to lower and center the CG location, promoting a higher launch angle, higher peak trajectory and a steep, soft-landing, quick-stopping descent angle for greater control. Fantastic feel promoted by a specially formulated polyurethane developed by 3M that fills the RBZ Speed Pocket and which quiets vibration without significantly slowing/inhibiting the flex of the pocket, while also keeping debris out. Improved Inverted Cone design reduces directional dispersion to promote improved accuracy. Control-oriented short-iron design with compact heads, thinner toplines and slightly thicker faces to promote feel and control. New external and internal hosel notches makes it easy to bend the head to adjust the lie angle. Milled face-texture and grooves promote consistently high spin. Not familiar with this shaft. I demo this club with stock TM 85 shaft and loved it. Can you explain difference in shafts?